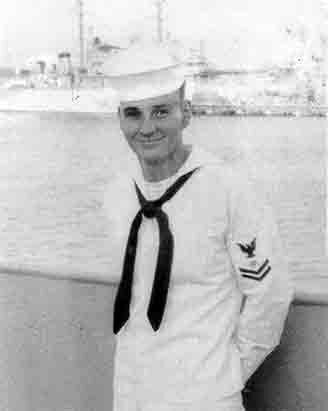 In August 1957, I left my home in Hamtramck, Michigan, and joined the U.S. Navy. Boot camp was at Great Lakes, Illinois. I wanted to be an Electronics Technician, and I got my wish. I was sent to Electronics School at Treasure Island, California, for six months of training. From there I was sent to the U.S.S. Henley DD-762 stationed at Norfolk, Virginia. The Henley made a cruise to the Mediterranean. "Join the Navy and see the World" was true for me. I got to visit Spain, France, Italy, the Persian Gulf, Bahrain, and Kuwait. From the Henley, I transferred to the U.S.S. Gyatt DDG-1, which was the first guided missile carrying destroyer. We operated in the Atlantic Ocean and I got to visit Cuba, Jamaica, and Haiti. Another transfer, and I was on the U.S.S. Robinson DD-562. One of our duties was to take reservists out for their two-week cruises, so we went out to sea making back-to-back reserve cruises. It was aboard the Robinson that I attained my final rank of Electronics Technician, Petty Officer 2nd Class. I had the option of re-enlisting, but civilian life was calling. After the Navy, I moved to Los Angeles and worked in electronics for Space Technology Lab (STL) which later became TRW and now Northrup Grumman. I met my wife, Dee, in Los Angeles, and when we married and were ready to buy a house, I found that I could get more bang for my buck by buying a home in Lakewood. We moved to Lakewood in 1964, and I am still living in that same house. We raised our two children, Karin and Michael, in Lakewood. They both finished college and became teachers. My daughter still lives in Lakewood, and my son lives in Seal Beach.